Picking up on the latest post about the use of ‘Be my Baby’ in the Portuguese movie Tabu, here’s a little bit about the iconic beat of what is perhaps the most classy of Spector’s releases. 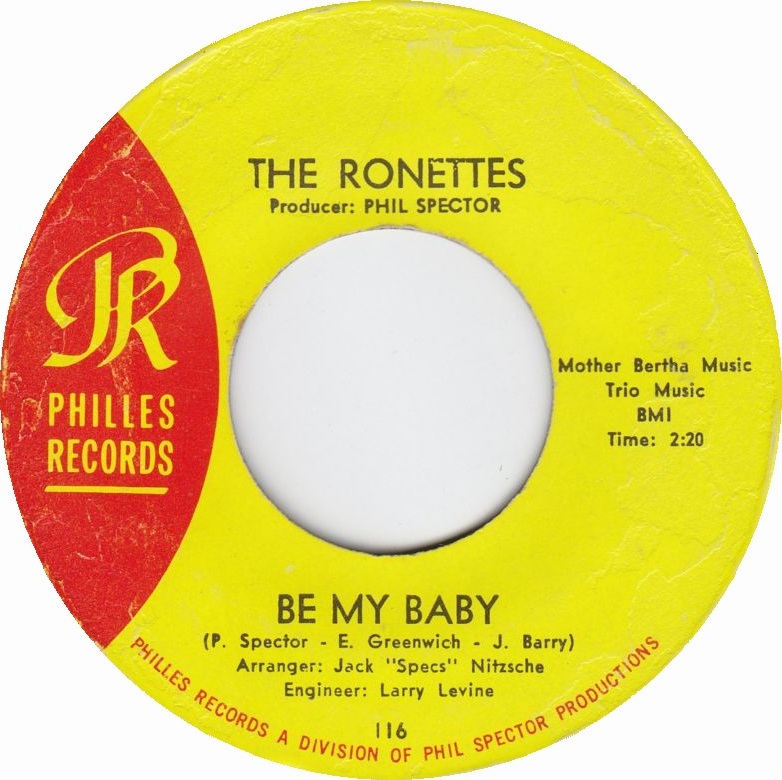 US rock critic Dave Marsh once pointedly described ‘Be my Baby’ as Spector ‘building a rock’n’roll cathedral’ around Ronnie’s voice – and it certainly is a fantastic production. None the least due to it’s catchy drum beat – ‘bum-ba-bum-BOOM!’ A beat so distinctive, it’s been copied over and over ever since. A fellow Spector-fan has alerted me to this three-part interview with the late, great master engineer Lary Levine. He shares his thoughts on Spector and the iconic sounds the two men created together at Gold Star. ‘Manning the meters’ – Larry Levine and Phil Spector at Gold Star. Hadn’t seen these segments before so they may be new to you as well. As the song went on and on I waited for a Wall of Sound to wash over me. But it never came. Instead, the simple, piano-based song just sort of petered out. I was perplexed. What? All this build-up I sensed. For nothing? That had to be the ultimate ‘coitus interruptus’ of Spector sound. The song was ‘You Ruin Me’ by Aussie girl pop duo the Veronicas. Even their name is tailor-made for the full-on blast of Spector sound that they foolishly didn’t go for. If you’ve followed my blog, you know it’s a sort of hobby of mine to dig up modern Spector soundalikes. Maybe that makes it all the more annoying for me when a song so seemingly perfect for a Spector tribute is left hang to dry in an unimaginative and tame sonic setting. Make no mistake. I like the song and ‘You Ruin Me’ is pretty good as is in this stripped production. But oh man, had the Veronicas dared to go all the way and pile on instrument after instrument this could have become a monster record, all swirling strings, tinkling glockenspiels and swaths of strummed guitars. Maybe I should devise a new moniker for these ‘could have been’ epics? ‘Potential modern Spector soundalikes’, perhaps? And this one must surely take the prize. If I knew how to play a dozen instruments I would waste no time and run to the nearest studio to overdub from here to eternity. This is of course not a new phenomenon. You can find songs in any decade that are just begging to be dressed up by someone wanting to outdo the Tycoon of Teen. In one of my past blog posts, reader Ian Chapman posted an April Stevens song from the 70s , (Won’t You) Marry Me Again’, that also should have been elaborately produced. Oh well, we can dream can’t we? Always funny to compare notes so if there are any songs out there that has always left you hearing a full-blown but imagined Wall of Sound surrounding a tame production, I’d love to hear about them. I’ll finish off with two similar, recent examples. The first one, ‘Dry your Eyes’ by Scottish group Texas on their most recent album, is a dead ringer for the kind of Spectoresque material Jackie De Shannon recorded in the 60s. But there are just too few Wall of Sound elements present for me to consider it as a modern Spector soundalike. The second one is Jenny & Johnny’s ‘Swichblade’. Cool song with good lyrics and nice singing. And the strummed guitar chords have the potential for a track with a great sense of propulsion, like, say, ‘Keep On Dancing’ by the Ronettes. But it doesn’t go anywhere from there and could have been so much more in the hands of the right producer. I know that ‘less is more’ and all that, and sometimes it really is. But other times, as I’ll venture is the case with the selections here there’s no reason at all to not go overboard and use everything but the kitchen sink. To my ears, that’s basically what these three lovely songs are cajoling you to do with their classic song structure. You can almost hear the Wall of Sound on there on some subliminal level. 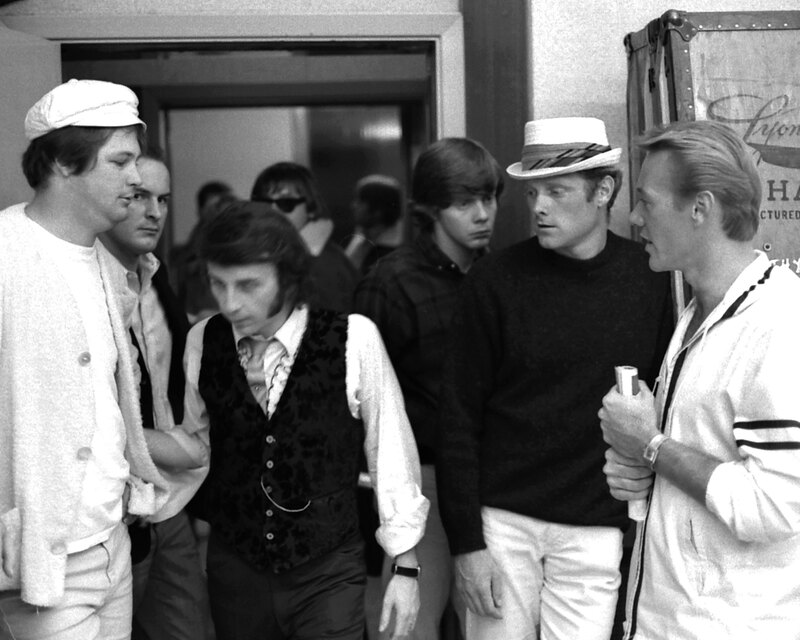 Following my fourth installment of the ‘Would-be Spectors’ feature about Brian Wilson last week, I’ve discussed the topic further on a Beach Boys fan forum. During the discussions music teacher, former studio owner and music historian Craig Clemens weighed in with some interesting reflections on the differences between Phil Spector and Brian Wilson. You may remember a former post here about Gold Star Studios where I linked to Craig’s blog http://www.classicstudiosessions.blogspot.com. Craig has graciously allowed me to feature his interesting reflections on Brian Wilson and Phil Spector as a guest post on Cue Castanets. Bear in mind that the following text was originally two forum posts that I have edited into one essay as I think you will enjoy Craig’s writing as much as I do. 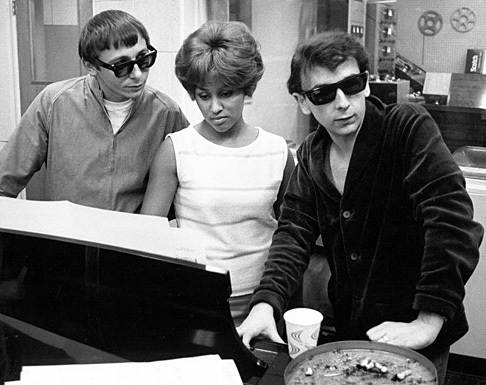 When comparing Phil Spector and Brian Wilson there are various differences between them to consider. For one thing, Spector had a head start of the two, and unlike Brian, Phil served an apprenticeship of sorts under the mentorship of Leiber and Stoller. If you listen to those more orchestral-leaning Leiber and Stoller tracks, like the Drifters, you’ll hear a lot of what would turn up later on Spector’s Wall Of Sound productions. Especially the auxiliary percussion like castanets, which really were not “rock and roll” or R&B as much as they were an orchestral/ethnic instrument sound. Spector used percussion like that extensively, and when Brian did copy Spector as in ‘Why Do Fools Fall In Love’ or ‘Then I Kissed Her’, there were the same elements. The best arrangers are like the best individual musicians; when you hear a few bars of their stuff you know who it is. It gets deeper than a lot of listeners notice, but take for a parallel example the differences on Sinatra’s 1950’s Capitol releases – one of the finest bodies of work in all of popular music. 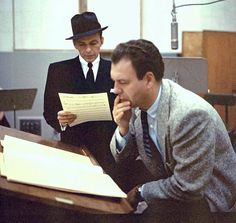 It is possible to hear the differences between a Nelson Riddle arrangement and a Billy May arrangement, but for a lot of listeners who don’t key into some specific details they can basically respond by saying “it sounds like Sinatra”. Yet, Riddle had a very unique and identifiable style…and overall mood/tone, which is more important to where I’m going with this regarding Jack Nitzsche… that you can pick his ‘tone’ out if you listen for it. Nelson was very unique, Billy May was an excellent arranger but when you got Sinatra singing a Riddle chart, there was a sympatico magic that happened in the performance captured on tape. Jack Nitzsche was a character, a really unique and quirky character who happened to be a terrific arranger, but to be honest having read about him beyond Spector, he had a different personality than some of his music suggests. The guy who did the ‘Christmas Gift for You’ album…Jack in person…not what you’d think. Nevertheless, I think it was Jack who crystallized the actual sound of Spector’s Wall. Others could write charts to exploit it, or even to copy it, but it was Jack’s arrangements along with the other pieces of the puzzle that just nailed it. I don’t base this on anything but opinion, but I think the fact that Jack and Phil were both characters who marched to their own drummer made the “Wall” as edgy as it was. It’s not a sensitive Wall, like Pet Sounds, it’s not an introspective Wall, like others. Rather, these teenage pop recordings are like a tidal wave and an earthquake which the lead singer has to either ride out or rise above, or risk getting swept up. Jack’s charts demanded something unique from whoever was singing lead. That’s just what Spector needed, that’s just what a true belter like Darlene Love brought in and what a really unique and different voice like Ronnie Spector brought in. Not every Spector production worked, naturally, but the ones that put the template into place and set the standard beyond even the music seemed to be Jack’s charts powering the engine. Seriously, try this, time permitting, as an experiment. Next time you can round up some volunteer listeners, grab some of Jack’s better known Spector arrangements and play them alongside the other arrangers Phil worked with on the Wall, Arnold Goland, Gene Page or Perry Botkin Jr. At the same time, get a handful of Nelson Riddle’s charts for Sinatra in the 50’s, and play them alongside Billy May’s charts, and even add a few Quincy Jones charts as well, or Gordon Jenkins. See which ones if any stand out above the rest, quality wise or just plain interest wise. I think Jack’s charts are the cream of the crop, the others solid and good but lacking that extra “something” that Jack brought to the process. Another parallel to consider: Both Brian and Phil had recording engineers at their side in the studio to bring their sounds to life, and more importantly capture them on tape. Phil had Larry Levine, Brian had Chuck Britz. I’d argue if they did not have those highly skilled engineers, who were both from the “old school” yet willing to break the rules to get better sounds on tape, the productions would not have been the same. I’d say Brian learned so much from Chuck as far as the nuts-and-bolts of capturing sounds on tape that it colored everything he was able to do which culminated with the year 1966. 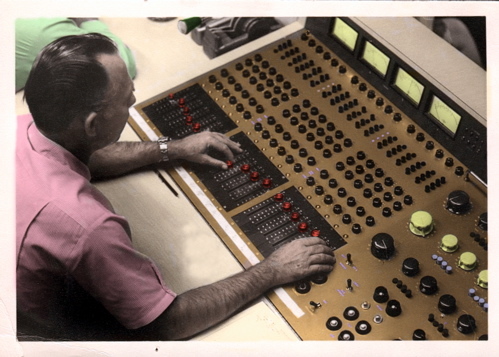 Chuck was like Brian’s mentor for sounds, and fortunately, Chuck was working at an independent studio that would allow Brian to be hands-on with the board without needing a union card to work the board. The untold stories are the hours that were spent with Chuck Britz as Brian watched and learned the technical aspects of studio recording and mixing. Chuck could be one of the most unsung heroes in the whole story. I’d guess that if he and Brian didn’t connect early on and were not so compatible working together, you would not have seen the level of work that Brian progressed into. 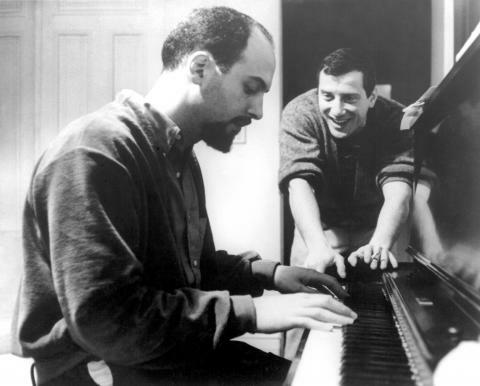 But consider this: Phil had Jack and Larry plus a mentorship with Leiber and Stoller under his belt, The Beatles had George Martin, Norman Smith and Geoff Emerick to get the sounds on their recordings, and Brian was basically a one-man show for arranging, orchestrating, and writing…plus production…with Chuck Britz, mostly, to record the sounds. For a guy in his early 20’s to have learned basically on-the-job without an apprenticeship or a formally trained musician like Jack Nitzsche or George Martin at the helm, it’s quite an amazing accomplishment to have that body of work in the 1960’s competing with those peers. My original plan for the ongoing feature about ‘Would-be Spectors’ was to show how nearly everyone within Spector’s studio inner-circle was inspired to churn out great records themselves with a heavy slant towards the Wall of Sound. So far, I’ve written about Nino Tempo, Jerry Riopelle and Jack Nitzsche, all of whom served as Spector’s right hand men at various sessions. Aiding Spector in LA’s Gold Star Studios, these guys literally attended a master class on how to achieve that massive monophonic sound. For one thing, he was absolutely obsessed with the Wall of Sound. In interviews he has often described how he had to pull over, literally shaking, when he first heard ‘Be my Baby’ in his car. In the book ‘Catch a Wave’ author Peter Ames Carlin even describes how Brian once had engineer Steve Desper make a tape loop of the ‘Be my Baby’ chorus so Brian could sit in a trance and listen to it for four hours straight! Secondly, Brian often utilized the same musicians Spector used, the Wrecking Crew, and occasionally also recorded at his preferred studio, Gold Star. 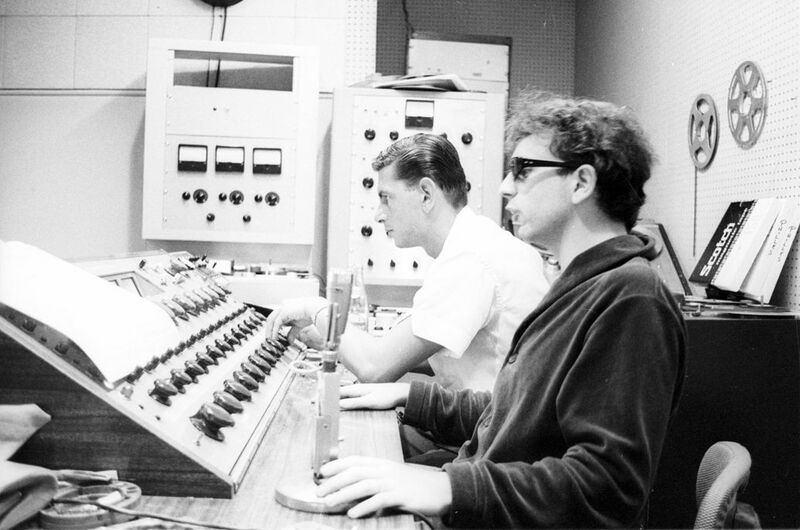 Brian even attended his fair share of Spector sessions as an observer. So just like Tempo, Riopelle and Nitzsche, he had plenty of opportunities to take notes on how to achieve the otherworldly sound and the rich blending of instruments. 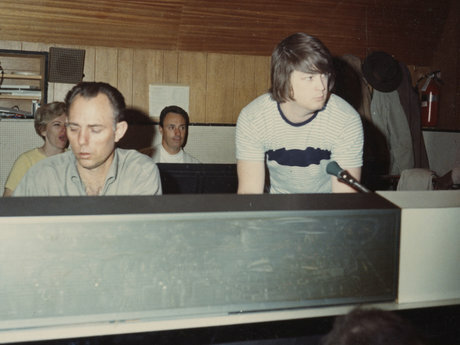 Brian Wilson (far left) at a Spector session in 1965 – others present are Mike Love from the Beach Boys, Righteous Brother Bobby Hatfield and in the background with Shades, Jack ‘Specs’ Nitzsche. And third, as far as I’m concerned, of all Spector’s contemporaries on the 60s LA studio scene, Brian Wilson was the one who went about using the inspiration drawn from the Wall of Sound in the most imaginative and original way. No Wall of Sound? 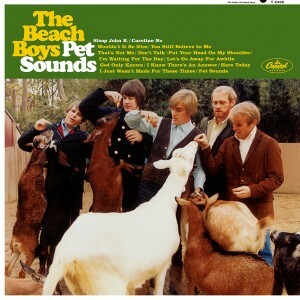 Probably no Pet Sounds – one of the greatest and most cohesive albums of all-time. And yet, an album with a sound that is much more tender and embracing than Spector’s often heavy-handed approach. In the ‘Endless Harmony’ Beach Boys documentary fellow producer Terry Melcher probably spoke some truth, when he described Brian’s sound as one of love as opposed to Spector’s ‘angry’ sound. It’s of course a very simplified, black & white view – what about gentle Spector productions like ‘I Love How You Love Me’, ‘When I Saw You’, ‘So Young’ etc? – but I agree with the basic distinction. ‘Anger’ is probably not the best term for Spector’s sound. More a sense of a deafening, overwhelming and intense grandeur that can easily be construed as aggressive and cluttered when compared to Brian’s often more sophisticated approach. Spector was and remains the ultimate master at what he did; creating glorious, gargantuan and monophonic monsters that would always pack a punch when played on the radio or record players. It’s a production style I obviously cherish enough to build a whole blog up around it! But truth be told, I don’t think Spector really diversified or softened up his sound with other influences the same way Brian did brilliantly time and again. That, in a nutshell, is probably the real distinction between these two master producers – the ambition to progress, break new ground and absorb outside influences that I’ve always found to be at the very heart of Brian Wilson’s art. 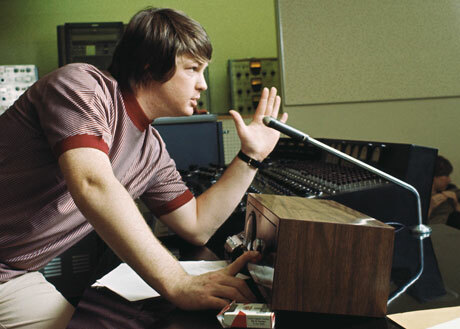 Brian during the sessions for Pet Sounds. As much as I love the work of Tempo, Riopelle, Nitzsche and other future ‘Would-be Spectors’ written about here, when they went for a Wall of Sound-type song, they didn’t stray far from what Spector did. Generally, they recorded dazzling carbon-copies that could make you double-check label credits to make sure that it wasn’t a Spector cut. However, I feel Brian often went about this in a much more nuanced manner. He usually only took the elements from Spector’s sound that would compliment his own distinctive strengths as a producer and mixed it up with other influences to great effect. ‘Don’t Worry Baby’ comes to mind as an example of this. Rumored to be originally written for the Ronettes, that stellar Beach Boys hit indeed has an obvious wall of sound influence, but the listener will also find those gorgeous trademark Beach Boys harmonies harking back to Brian’s other fetish, the vocal magic of the Four Freshmen. And there’s even a bit of proto folk-rock thrown in by way of that iconic electric guitar-plucking throughout the track. Terry Melcher copied that feel blatantly on his production of ‘Mr. Tambourine Man’ by the Byrds. 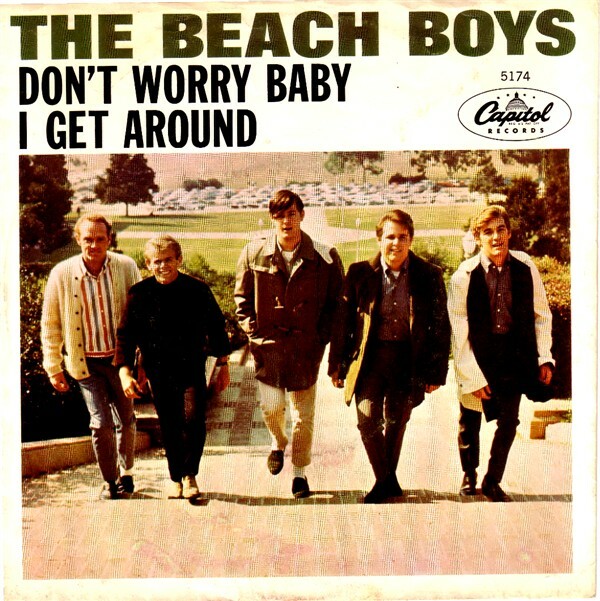 Don’t Worry Baby / I Get Around – how’s that for a killer single? The mind boggles thinking about what could have been had Brian Wilson and Phil Spector somehow put their guards down and overcome their insecurities in order to collaborate on songs back in the day. Their professional competition certainly resulted in some great productions on Brian’s part. Like I always do, I’m going to finish my post by highlighting three favorite recordings. The Beach Boys – I Do (1963) – Brian showed off his Spector influence most clearly on some of the cool productions he made on the side for other acts like girl-surfer group the Honeys and singer Sharon Marie. There have been a few compilations gathering all these great, overlooked productions. ‘I Do’ was issued by vocal group the Castells, but this take by the Beach Boys themselves I think is even better due to the superior Beach Boys vocals. Unbelievably, this gem was unreleased at the time, not even creeping out as album filler. Glen Campbell – Guess I’m Dumb (1965) – Yet another outside production proving that Brian mastered achingly beautiful big ballads as well as Spector. Like most of Brian’s Wall of Sound-inspired tracks there’s more air to the sound than the rumble, a Spector production would have entailed. In truth, there’s as much a Bacharach influence going on here. Listen to how Glen Campbell nails that beautiful melody! Beach Boys – Kiss Me Baby (1965) – Rather than doing the obvious and feature a track from Pet Sounds, I’m going to pick this cut from the previous Beach Boys album, Today. The second half of that album was made up of wonderful, tender ballads that heralded the unheard sophistication Brian’s work had taken on by the release of Pet Sounds. Harmonies to die for and a dense backing track– sheer pop heaven!